In Amelia Island, einer Insel im Norden von Florida bei Jacksonville, veranstaltete RM Auctions am 8. März 2014 seine Versteigerung mit zahlreichen Autolegenden. Die Versteigerung fand im 5-Sterne Luxushotel Ritz-Carlton Hotel am Amelia Island Parkway statt. Dieses auf einer historischen vorgelagerten Insel direkt vor der nordöstlichen Küste Floridas gelegene Luxus-Strandresort liegt etwa 35 Minuten von der Innenstadt von Jacksonville und 30 Minuten vom Internationalen Flughafen Jacksonville entfernt. As vintage car collectors and enthusiasts from all walks of life descend on island, The Ritz-Carlton, Amelia Island is gearing up for heavy traffic. When the Concours d ‘Elegance rolls into town March 7-9, 2014, the luxury resort nestled along a quiet stretch of Florida’s Northeastern coast starts four days of non-stop vintage car action. 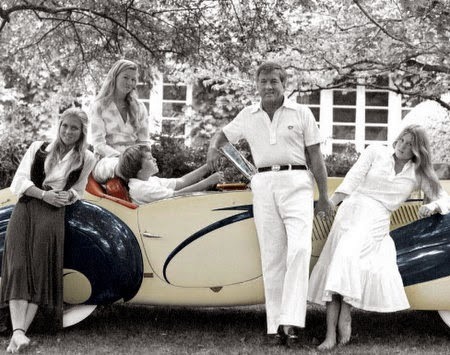 “As the founding sponsor, this week is a honored period for the resort whose first general manager in 1995, fashioned the idea for an Amelia Island Concours d’Elegance and asked Bill Warner, a local vintage car collector, to own it and develop it. The rest is history,” says James E. McManemon, the current general manager of the resort. Bill Warner grew the show by searching the world for rare cars, hosting an international auction and selecting entertaining panels from racings golden era when drivers where regarded as international athletes and celebrities. Over 5,000 enthusiasts attend the special functions and another 15,000 attend Sunday’s grand finale, the award ceremony and display of 250 show cars. “It is an amazing experience to welcome thousands of people from all over the world who pass through the resort … celebrities, corporate CEO’s, dignitaries and, of course, the local community all sharing their admiration for these classic cars,” he added. Just how much has the show grown? The first show in 1995 viewed 125 cars and drew 2,000 enthusiasts. This year’s 19th Concours has over 250 show cars and 20,000 spectators are expected to attend Sunday’s Concours and award presentation. The Concours d’Elegance represents spring’s arrival to Amelia Island.